Most of this site is about how fluoride prevents cavities and makes teeth whiter (including white spots). You may want to look quickly at the other observable physical effects of fluoride on teeth. Here is one of Dr. Glenn's lucky patients. 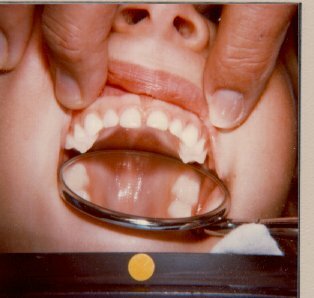 You can see the whiteness of the primary teeth from prenatal fluoride. 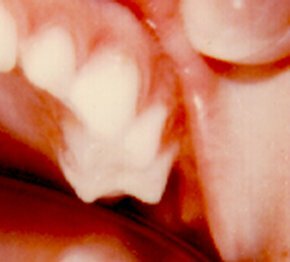 The other effects you can see if you look closer are the smooth molars and glossy enamel. Let's go in for close-ups. This picture reminds me of the time I took my first child to his first dental appointment at about age 3. I had tried prenatal fluoride, but didn't know much. The dentist's first words were, "Hmm, no pits and fissures", which didn't mean anything to me at the time. 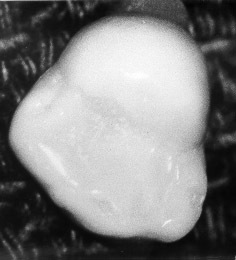 This is a close up of a very smooth molar. The total lack of pits and fissures is from prenatal fluoride. This is dramatic case of pits and fissures. Without prenatal fluoride, more than a fourth of molar teeth have a pit large enough to catch on an explorer. The other physical effect you can see with the naked eye is the smooth glossy enamel that looks something like the inside of a seashell. Above is the reason the enamel looks like that. 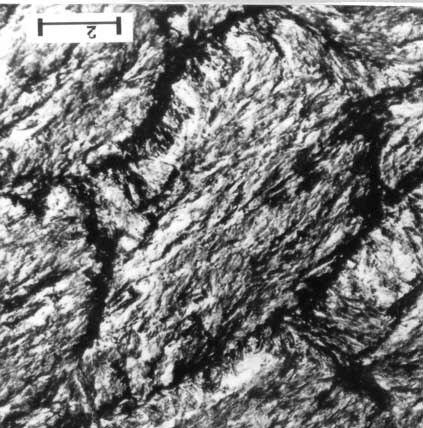 This photo is from a scanning electron microscope. 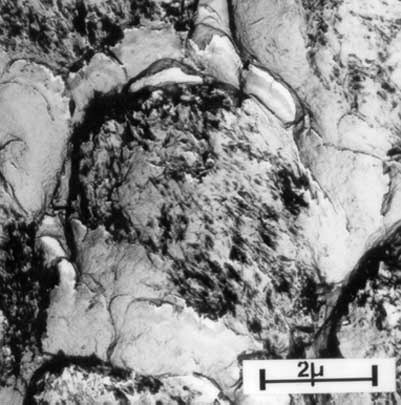 It shows the enamel surface of a tooth with prenatal fluoride. The size of the area is about the size of a cell. It was hard for me to grasp the difference between this one and the one below (without fluoride) right away. The way it eventually made sense to me was thinking of it as the surface of concrete, and I had to use a pick to tear it apart. The one on the bottom has places I could put my pick to start prying pieces off.